Karl Ernst was born September 1, 1904 in Berlin. It is hard to say for sure if he was gay, but we know that he had worked as a bouncer for a gay nightclub in Berlin in the 1920s. 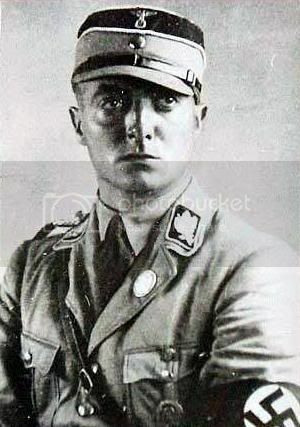 He later joined the SA which was run by two gay men - Ernst Rohm and Edmund Heines, and it seems very possible that they may have been brought together through gay social circles. If he had homosexual relationships, which have not been confirmed, he was most likely bi-sexual. He married a young women in Bremen in June of 1934. The young couple were on their way on honeymoon to Madeira when, on June 30th, Adolf Hitler undertook a "purge" of the SA. Ernst's wife and chauffeur were both wounded but survived while Ernst was taken back to Berlin by SS Officers. He was briefly imprisoned at the Cadet School at Lichterfelde and then shot, along with several other SA leaders, by a Liebstandarte firing squad.